Bestselling writer Jonathan Lethem -- author of one of my favorite novels Motherless Brooklyn -- has put together an offer that's hard to beat. He'll sell you a story for a book, play, or screenplay for a mere $1. Then you can take the story idea, make it your own, and move it in new and unexpected directions. This is obviously not a get-rich-quick scheme. It's actually more about bringing Larry Lessig's notion of free culture to the literary domain. 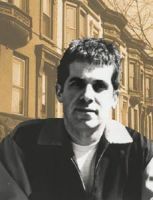 You can get more on Lethem's ideas here, but the upshot is that Lethem, being a fan of "adaptations, appropriations, collage, and sampling," wants artists to "make material free and available for [creative] reuse." (Some of this thinking informs a recent piece in Harper's called "The ecstasy of influence: A plagiarism.") The initiative, which he calls The Promiscuous Materials Project, offers a step in the right direction. Related Content: Give a listen to this engaging interview with Lethem where he talks about this project and more. Also check out Lethem and other authors speaking at Google. Tell us what books have changed your life. Three days left. We have over 30 contributions so far. Keep them coming.